Kiruna Utility Vehicles develops and manufactures customized vehicles for steelworks and smelters. Among our products are: Slag Haulers, Coil Carriers, Container Handlers and Tractors & Trailers. Our products are used at steelworks and smelting plants both locally and abroad. We deliver to companies that are known to place the highest demands on technology and efficiency, and on achieving a sustainable life-cycle economy. Many of our trucks are still in operation after more than 20 years of service and 30-40,000 hours of hard work. 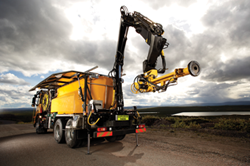 We are continuously developing our vehicles for maximum driver and operator safety. For example, the rear wagon of our vehicles is designed to minimize the risk of tires catching fire through contact with spilled materials and the driver’s cabin is constructed to be a safe and comfortable workspace that is optimally soundproofed and equipped with a highly developed cab suspension system. In order to meet the most demanding international environmental standards, we use modern diesel engines with AdBlue® Diesel Technology. Since Kiruna Utility Vehicles was established in 2012, our portfolio has developed steadily, from the proud heritage of Kiruna Truck to the forefront of modern vehicle technology. NMV Utility Vehicles manufactures vehicles for LKAB, Boliden, Atlas Copco etc. 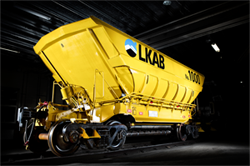 Kiruna Wagon manufactures ore wagons for LKAB, Boliden and Northland Resources. Since 2012, Kiruna Utility Vehicles is part of the NMV Group, a diversified industrial corporation consisting of six companies in the Norrbotten County in northern Sweden. The NMV Group is headed by Nybergs Mekaniska Verkstad, which began as a small workshop company in Kiruna in 1947, and has grown steadily into a versatile and innovative engineering company that specializes in the production of heavy steel and sheet metal structures. NMV has operations in Kiruna, Luleå, Piteå and Jokkmokk. The other companies in the NMV Group are: hot-dip galvanisation specialist NMV Galvteknik, auto company Dahlberg & Roos, real estate company Turris and rail freight wagon manufacturer Kiruna Wagon, which develops and manufactures wagons for the international market.